Australia's first tropical cyclone of the 2018/19 season developed over the northern Coral Sea on Sunday, and it should help cause some rain over fire-ravaged central Queensland during the middle of this week. Since forming on Sunday afternoon, Tropical Cyclone Owen has been lingering about 1000km off the coast of northern Queensland. Owen was a category one tropical cyclone on Monday morning and may intensify into a category two system later in the day. Fortunately, it's too far away from Australia to pose a direct threat to Australia's coastline in the near-future. 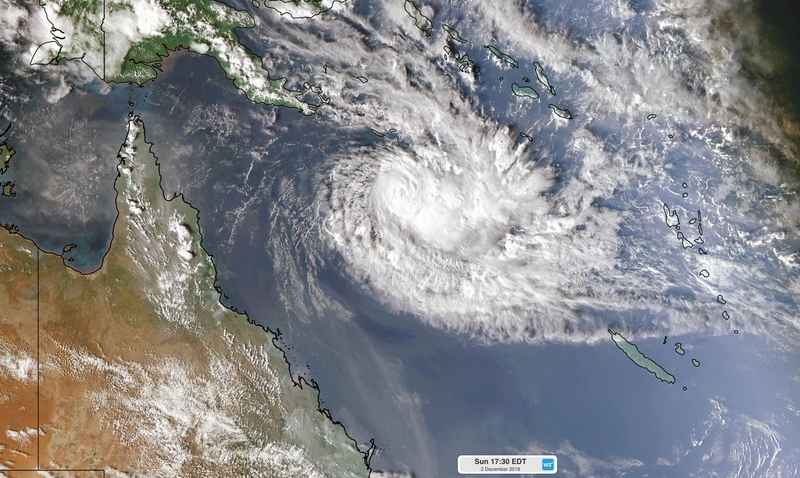 Image: Tropical Cyclone Owen formed over the northern Coral Sea on Sunday afternoon. According to the Bureau of Meteorology, Owen should turn towards the west by Tuesday, allowing it to move closer to Queensland during the middle of the week. However, the system should weaken as it moves closer to Australia due to increasing wind shear. The term wind shear refers to a change in wind speed and direction with height. Tropical cyclones collapse in strong wind shear. While Cyclone Owen isn't likely to reach Queensland's coast in the coming days, it will help direct moisture-laden air towards the state's eastern districts this week. As a result, showers and thunderstorms are likely to affect fire-scarred and heatwave-weary areas of central Queensland from Tuesday. While the rain from this moist air will be helpful for fire-affected areas, some of the thunderstorms are likely to cause damaging winds, particularly on Tuesday. These severe storms may cause fires to spread rapidly in unexpected directions. The injection of moisture-laden air will also end the record-breaking heatwave that has gripped large parts of central and northern Queensland during the last couple of weeks. Mackay is forecast register its first maximum temperatures below 30 degrees since October towards the end of the week. Visit http://www.bom.gov.au/cyclone/index.shtml for the latest information on Tropical Cyclone Owen.